Fidel Castro said in a statement read on state television Tuesday that his health is good and he is in fine spirits after watching reports of newly revealed Super Villain PJM of West Texas. "I have known PJM for a long time now, we have a good working relationship. I'm glad the world knows about him, keeping his existence a secret was tough for me, I just kept referring to him with friends as 'El Gringo Gran.' Most people don't know this, but without McWhorter cigar purchases, our economy would have collapsed long ago." Castro continued, "I have watched with admiration his latest plan to rule the poles. I've often dreamed about a partnership where I could rule the tropics and he could have the ends of the Earth! I like to think that his Embargo idea, he got that from me." Castro continued his uninterrupted talk with reporters for the next five hours on a variety of topics ranging from baseball to peafowl weaponization. 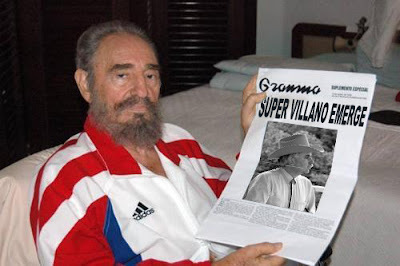 At one point, Castro seemed slightly wary of the now public Super Villain. "No matter how much I may like the guy, he scares me. Even Che had an off-switch. I mean, I may have graves in my front yard, but who is so bold as to mark them with tombstones? He is like the younger brother I've never had!" Defense Minister Raúl Castro, who turned 79 in June, has for decades been the constitutional successor. He did not appear on television and made no statement of his own. Cuba has declared Wednesday to be "Rue the Day" Day, a national celebration in honor of PJM. Government work centers summoned employees to participate in outdoor political gatherings to express support for the Super Villain. Dozens of workers at one gathering waved small Cuban flags and shouted, "Long live Gringo Gran" and chanted "Pe-Jota-Eme!" "There is no one else like him," said Ernesto Fernandez, 29, drinking rum at a cafe. "I would join a polar expedition with PJM any day!" In related news, weighing his words carefully on a fiery political issue, President Obama seemed to contradict his earlier statement in support of PJM by saying that while Super Villains have the right to build fortress lairs in West Texas, he did not say whether he believes it is a good idea to do so. White House Press Secretary Robert Gibbs, further clarified the President's position. "Look, although some Americans may not like the idea of Super Villains living in America, we cannot prevent them from plotting to destroy the country - otherwise how could we have a Congress?" After reading your excellent objective blog I’ve become very concerned about the wellbeing of our country. What can we do about this danger? How can we help? What about Europe? As usual they do nothing. I can assure you that the European Union takes this threat to world peace very seriously, and will take affirmative action in supporting the peacekeeping mission to conquest the hearts and minds of every civilian in danger of this imminent menace (as long as it does not involve sending troops, money, support material or anything else that costs money). Would you please stop tormenting the Dear Husband. This fued is destroying him. I can not even get him to read this month's issue of Big Dan's Tractor magazine. Your letter has deeply touched me. I know you are a kindred spirit, tormented like myself by PJM. His use of your family as human guinea pigs in his diabolical sleep depravation experiments, using large noisy flags outside your home, is a tragic tale. I will have to consider a truce, for your sake. The question is can one ever negotiate in good faith with Super Villains? mebe u giv dat boy a big pology, den maybe we ken en dis ting for it gits wors.